Luxating patella is a condition where the kneecap (patella) moves out of its normal position. Luxating patella is one of the most common knee joint abnormalities of dogs, but it is only occasionally seen in cats. It may affect one or both of the knees. In some cases it moves (luxates) towards the inside of the knee, and in other cases it luxates towards the outside of the knee. 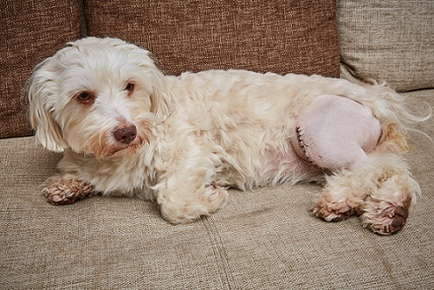 Luxation to the inside of the knee is the most common form seen; it is most commonly seen in the small or miniature breeds of dogs such as Poodles, Maltese, Yorkies, and Chihuahuas. Luxations towards the outside of the knee are seen less frequently. It can be present in many breeds, but is seen especially in Newfoundlands. Grade I- the kneecap can be manually luxated but the kneecap returns to its normal position when the pressure is released. Grade II- the kneecap can spontaneously luxate out of position with just normal movement of the knee. Grade III- the kneecap remains luxated most of the time but can be manually reduced into the normal position. Dogs frequently start with a Grade I or Grade II and worsen over time to a Grade III or IV. Many people are not aware their pet is affected, but a luxating patella can cause pain. Owners may see the pet limp on a rear leg, or they may see them shake a rear leg to try to snap the kneecap back into place. A serious consequence of patellar luxation is that it predisposes the dog to a rupture of a ligament inside the knee called the anterior cruciate ligament (ACL). ACL ruptures are very painful, at least initially, and usually the dog doesn't bear weight on the affected leg. Surgery is indicated for any case that is causing lameness or pain. Owners may also elect corrective surgery as a way to prevent an ACL.